Back in 2003, when I wrote "Healing Heart", it was an absolute must for me to write a happy tune. I had had a "down" period in which I had been working for some time on a very melancholy tune called "Heartbreak". It was so sad that I simply had to compose something happier for cheering up myself. It was almost like an order of a commissioned work - from me to me. But it worked! I wrote "Healing Heart" and my mood immediately got a lot better. Isn't it funny how music has an influence on our moods? Anyway, later in 2003, when I recorded "Heartbreak" for my album "Acoustic Guitar 2", it felt obvious to let "Healing Heart" follow "Heartbreak" on the tracklist of the CD - just like the two music pieces followed each other when they were written in real life, so to speak. 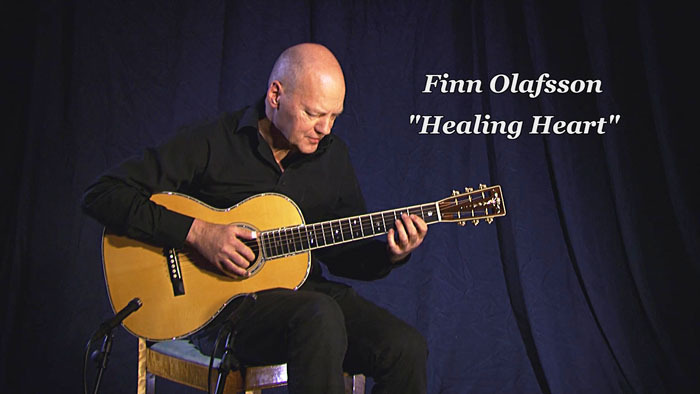 It is a little odd to play a ragtime-flavored tune like "Healing Heart" in a renaissance guitar tuning. But that's in fact what has happened - and that's what I'm doing. I play it in an EADF#BE tuning, the same tuning as I play in January's video, "Dark Patterns" and February's video "For Maria". Opposite to "Dark Patterns", which is played in key of B minor, "Healing Heart" is played in the key of E major. But just like I find B minor very suitable for this EADF#BE tuning, the open B, the dominant to the key of E - with no thirds - is sounding really well because of the 3rd string tuned down to the F#, the dominant of B. I have written more about the EADF#BE tuning in the text about "Dark Patterns" (Link) and "For Maria" (Link). 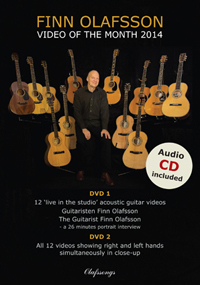 "Healing Heart" was published in staff notation / tablature (Tabs) in the music book "Finn Olafsson Acoustic Guitar 2" (Olafssongs 2000 Catalogue OC2006-2). 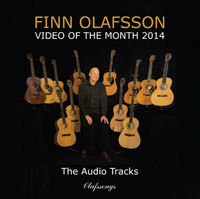 The book is available at the webshop of Olafssongs (Link). 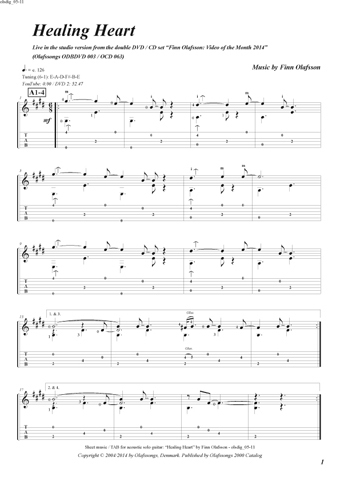 The staff notation / tablature (Tabs) will soon also be available at the webshop of Olafssongs as "single sheet" - in a downloadable pdf version. C.F. Martin's 00 size, with 12 frets clear of the body, dates back to 1873. On August 1, the earliest 00, an 00-28, was mentioned in Martin's ledgers. 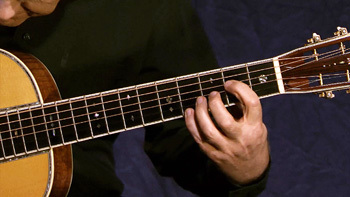 Until 1873 the 0 size was considered to be a full-size guitar. It was also known as a "Concert" model. But with the larger 00 size a "Grand Concert" model was born. The guitars at that time were stringed with gut-strings, but along with the need for guitars with greater volume, Martin, during the 1910s, updated many of their models with heavier bracing for steel-strings. In 1927 steel-strings finally was listed as standard. The first 00 size build in C.F. Martin's 42 style was produced in 1898 when 3 guitars were sold. The 42 ornamentation style at that time featured abalone pearl top border (45 style), pearl rosette, ivory bound body and fingerboard, ivory bridge, ebony fingerboard with inlays in 5th, 7th, and 9th frets. Later celluoid bindings replaced ivory, ebony bridge replaced the ivory bridge and more inlays in the fingerboard were added. In 1943, the last six 00-42 guitars were build, and with only one exception, an 00-42, produced in 1973, the model has been in dormancy until 2007 when a limited edition of 100 + 4 protos of an 00-42K Robbie Robertson Signature Edition (koa back and sides with an Italian spruce top) and 100 + 4 protos of an 00-42K2 Robbie Robertson Signature Edition (koa back and sides with a koa top) were offered. To honor Robbie Robertson and his contributions to American music Martin introduced these two versions of the 00-42. 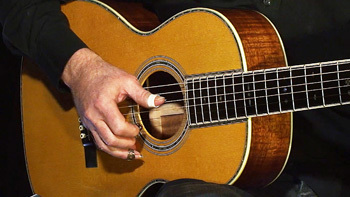 They were based on Robbie Robertson's favorite Martin, a 1919 00-45K - the only koa 00-45 ever produced. The 2008 00-42K Robbie Robertson I play in this video is #55 of 100. It is the version with an Italian spruce top. 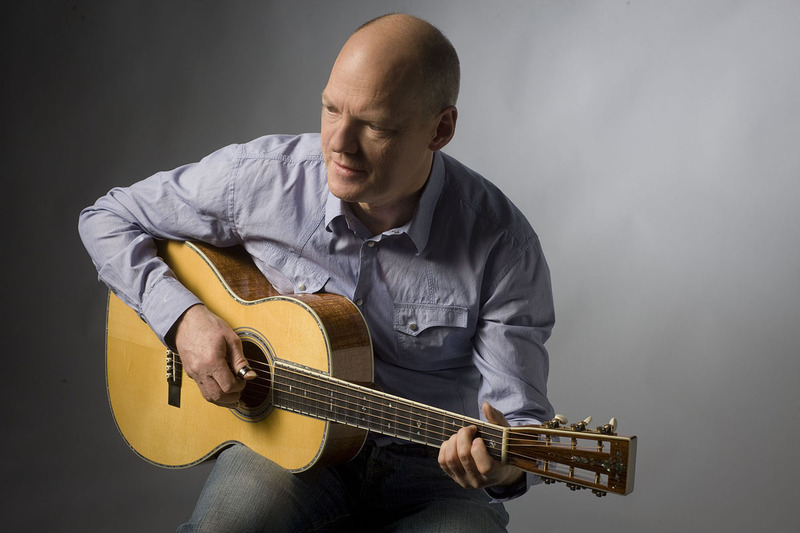 In 2009, at a visit in TFOA's, The Fellowship of Acoustics, shop in the Netherlands, I had the pleasure of playing one of the guitars from the 00-42K2 Robbie Robertson edition. I really enjoyed playing it, but as I already had kind of "filled up the trunk" with guitars, I decided to let it stay in the shop. Hmmm! Sometimes in your life you make mistakes. So did I that day! 'Cause, when I changed my mind and called for the 00-42K2 it was sold to another TFOA customer. 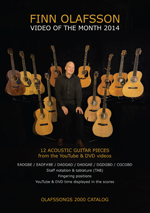 But, as you know, all the time there's a lot of guitars offered around the world. So luckily, at another trip to TFOA's shop, the 00-42K RR I play on "Healing Heart" came in with the carrier just as I was on my way out of the shop. And this time I didn't miss the chance. And I haven't regretted that one second. It's a great guitar - small bodied but with a big voice. I hope you agree when you watch the video. The Sounding Board, Vol. 23, July 2007.